Coming up with distractions, diversions, and delay tactics can be almost as much work as work itself. 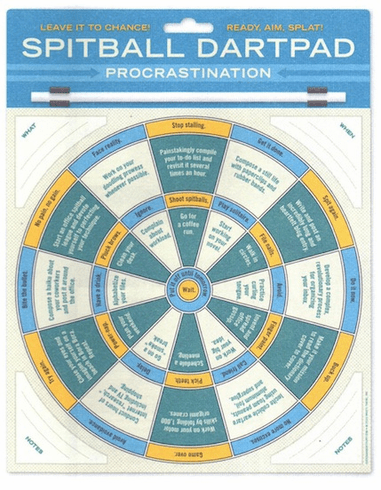 With fifty all-purpose suggestions for shirking responsibility, passing the buck, and avoiding deadlines, the Procrastination Spitball Dartpad makes high-quality postponement fun again. Each package includes 40 Dartpad sheets, each 9.75 x 11.75-inches - plus one spitball straw! The fun never ends with the Procrastination Spitball Dartboard so don't keep it to yourself, host a Spitball Dartboard tournament!